Keep your business ahead of the game with the HP LaserJet Pro M203dn, which provides you with wireless technology to make it even quicker and easier to print all your important documents. The printer uses JetIntelligence toner cartridges that have been specifically designed to work with this model and give you consistent and flawless results each and every time. The M203dn is extremely quiet when in operation and is very energy-efficient, with the ability to conserve energy when it’s not in use. The HP LaserJet Pro M203dn has an internal 250-sheet paper tray, which limits the size of the printer, and there is an additional 10-sheet multi-purpose tray to make it easier to change media types. This HP model makes printing on the go a breeze, with the ability to connect via wireless, so users can print from their PC, smartphone or tablet at the touch of a screen. Printing black and white documents is straightforward with the M203dn and there’s no need to wait ages for your documents, as this model has a print speed of up to 28 pages per minute. All your documents will come out crystal clear and with sharp texts and graphics, thanks to the high 1200x1200 dpi resolution, so you don’t need to worry about reliability or quality issues. Even when the printer is using its energy saving mode, you can have your first page printed off in only 7 seconds and it’s capable of fast two-sided printing as well. 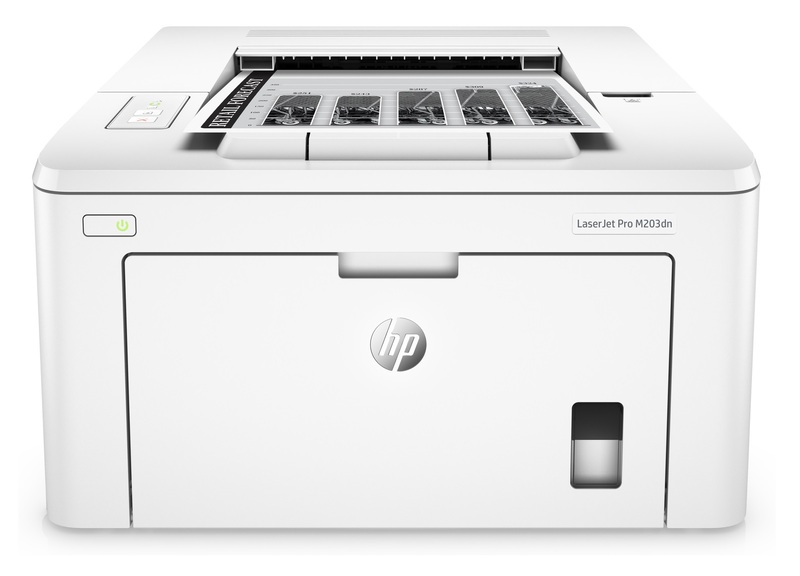 The HP LaserJet Pro M203dn is not a multi-function device and only has the facility to print black and white documents. It’s designed to print between 250 and 2,500 pages a month and the paper capacity is limited to 260 pages.